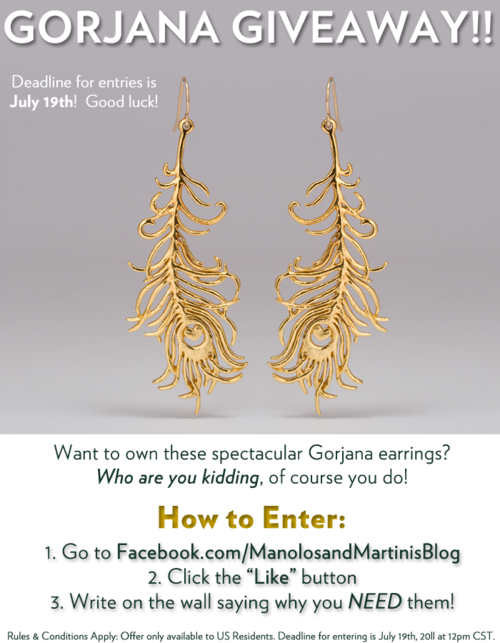 I’ve paired up with amazing jewelry designer Gorjana for a fabulous giveaway! Enter to win a FREE pair of these beautifully crafted peacock feather earrings by following the instructions below!! 3. Write on the Facebook page wall telling us why you NEED the earrings or how you will wear them!! The most creative entry will win a pair of the coveted peacock feather earrings! For a bonus entry, head over to the Gorjana Facebook page and “like” them too – be sure to include this in your wall post if you have “liked” us both! Rules & Conditions Apply: Offer only available to US residents. There will be only one winner which will be decided by Manolos and Martinis based on the most creative response on our Facebook wall. Deadline for entering the giveaway is July 19th, 2011 at 12pm CST.